Bag fees are not against Southwest’s religion and, with the acquisition of checked-bag-fee charging AirTran, management is undoubtedly mulling whether to see the green light. Southwest Airlines famously doesn’t charge for first and second checked bags, but last year the carrier became the fifth largest ancillary revenue collector among the 50 airlines around the world that disclose those numbers. An IdeaWorks-Amadeus ancillary revenue study put Southwest among the top 10 airlines in total ancillary revenue for the first time in 2011, at number five, with $1.18 billion in such revenue. That’s not a well-known story among passengers. Chalk up Southwest’s status — one that the airline won’t be touting on its TV commercials — to its unorthodox boarding process; a revised Rapid Rewards program; the addition of AirTran, with its checked bag fees, for the second half of the year; an aggressive fee program (unaccompanied minors, excess baggage, pets and early boarding), and Southwest’s status as the third largest airline in the world in terms of passengers flown. Southwest plane. Photo by BriYYZ. Southwest, for example, collected $142 million last year for EarlyBird boarding at $10 a pop. And Business Select, which includes priority screening, a headstart on boarding, and a libation, accounted for $96 million in revenue, IdeaWorks states. However, many Rapid Rewards members weren’t pleased with the changes, including an awards system that doles out points based on the fare type purchased. Lose the free bags policy? 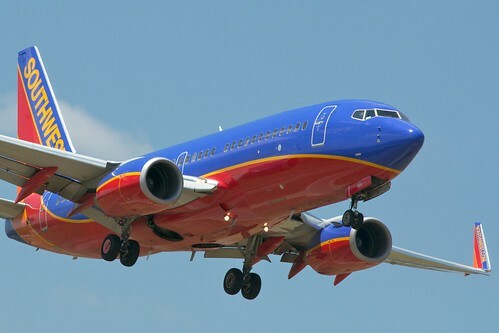 Jay Sorensen of IdeaWorks notes that although Southwest has owned AirTran since May 2011, Southwest has continued to allow AirTran to charge fees for first, second and third bags, and this has generated a lot of ancillary revenue. “If Southwest really had a corporate philosophy against this, they could have scored hero points” if they discontinued AirTran’s checked-bag fees, Sorensen says. Hero or villain, bag fees or not, Southwest has quietly emerged as a leader in squeezing ancillary revenue from partners and passengers.